U.S. President George W. Bush made a surprise visit to Iraq on Monday, using the war zone as a backdrop to argue his case that the buildup of U.S. troops is helping stabilizing the nation. Bush secretly flew 11 hours to Iraq as a showdown nears with Congress over whether his decision in January to order 30,000 more U.S. troops to Iraq is working. Defense Secretary Robert Gates arrived ahead of Bush, and convened a meeting with the country's top political leaders to highlight Bush administration hopes for prodding Iraq into a "bottom-up" approach to national reconciliation. Gates conferred with senior U.S. officials, including Gen. David Petraeus and U.S. ambassador to Iraq Ryan Crocker , before opening a session with Prime Minister Nouri al-Maliki, President Jalal Talabani, and other top Iraqi officials from Baghdad. Bush and his national security team flew directly to this air base in a remote part of Anbar province, bypassing Baghdad in a symbolic expression of impatience with political paralysis in the nation's capital. The gesture underscored the U.S. belief that the spark for progress may come at the local level. Next week, Petraeus, the top U.S. commander in Iraq, and Crocker, testify before Congress. Their assessment of the conflict, along with a progress report the White House must give lawmakers by Sept. 15, will determine the next chapter of the war. The United States cannot sustain the troop buildup indefinitely. And with Democrats calling for withdrawals and a rising U.S. death toll that has topped 3,700, Bush is hardpressed to give al-Maliki much more time to find a political solution to the fighting. Bush stopped in Iraq ahead of his visit to Australia for an economic summit with Asia-Pacific leaders. The trip was a closely held secret for obvious security reasons, although speculation about the trip arose late last month when first lady Laura Bush said she was staying home to tend to a pinched nerve in her neck. The president, who also went to Iraq at Thanksgiving 2003 and in June 2006, was scheduled to leave for Australia on Monday, but Air Force One took off from Andrews Air Force Base Sunday evening instead. He was joined by his top advisers, including National Security Adviser Stephen Hadley. Joining Gates were Gen. Peter Pace, chairman of the Joint Chiefs of Staff, and Adm. William Fallon, the top U.S. commander in the Middle East. Fallon flew aboard Gates' Air Force plane from Washington. The mission to shore up support for the war was shared with only a small circle of White House staffers and members of the media, who were told that if news of his trip leaked early, it would be scrapped. 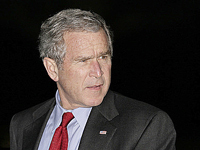 The White House arranged Bush's trip at a pivotal juncture in the Iraq debate. Some prominent Republican lawmakers have broken with Bush on his war strategy, but so far, most Republicans have stood with Bush. In exchange for their loyalty, they want to see substantial progress in Iraq soon. Making his case before the Sept. 15 report deadline, Bush recently delivered a series of speeches to highlight how the temporary military buildup has routed out insurgents and foreign fighters. Bush has described what he calls "bottom-up" progress in Iraq and often cites a drop in violence in Anbar Province, once a hotbed of insurgency. The turnaround occurred when Sunni Arab leaders joined forces with U.S. troops to hunt down members of al-Qaida, although it's unclear whether they'll back a unified Iraqi government as well. There are now 162,000 U.S. troops in Iraq, including 30,000 that arrived since February as part of Bush's revised strategy to provide security so Iraqi leaders could build a unity government. Bush met on Friday with his top military chiefs at the Pentagon who expressed concern about a growing strain on American troops and their families from long and often multiple combat tours. Still, early indications are that the president intends to stick with his current approach - at least into 2008 - despite pressure from the Democratic-led Congress and some prominent Republicans. Right now, the White House is working to keep Republican members of Congress in the president's fold to prevent Democrats from amassing the strength to slash war funds or mandate immediate troop withdrawals.